Food, football, and…oppression. That’s what Thanksgiving has come to mean to many Americans. This new narrative describes the Pilgrims as arrogant oppressors who fled persecution only to become persecutors themselves, depriving Native Americans of their land and their lives. But this is wrong on every count. 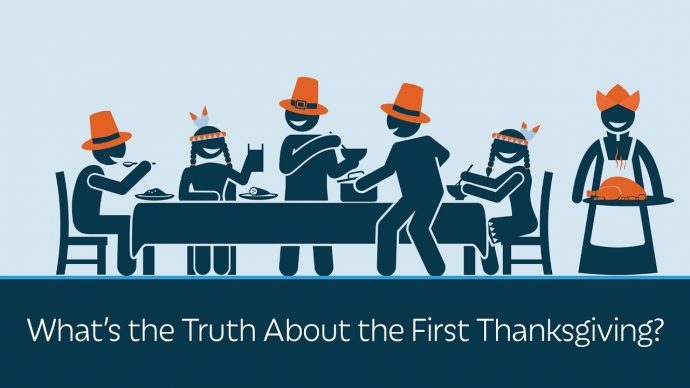 First of all, the Pilgrims didn’t cross the ocean to flee persecution—or even England. They’d been living for over a decade in Holland, Europe’s most tolerant nation, and a haven for religious dissenters. Free from interference by the Church of England, they feared seduction—not persecution, worrying that their children would be corrupted by the materialistic Dutch culture. That’s why they risked their dangerous 1620 voyage to a wilderness continent: not because they were running from oppression, but because they were running toward holiness—fulfilling a fateful mission to build an ideal Christian commonwealth. They initially planned to plant this model society on the wild, wolf-infested island known to natives as Manhattan, but winds and tides blew them 250 miles off course, dumping the Mayflower on the frozen coast of Massachusetts. Somehow, the Pilgrims saw their dire situation as a demonstration of providential power—especially after a giant wave picked up the flimsy boat of a scouting party on a stormy December night. The turbulent sea then deposited them safely—miraculously—on a little island within sight of the ideal location for their settlement. It was a deserted Indian village with cleared land, stored supplies of corn, and a reliable source of fresh water. No, these supposedly cruel conquerors never actually invaded that village. Instead, they expressed a fervent desire to pay the natives for the dried corn they found, if only they could find someone to pay. But the former inhabitants had perished during three years of plague—probably smallpox—that immediately preceded the Pilgrims’ arrival. Previous articleNever Mind ‘Trumpism’: What is ‘Deplorablism’?